Strictly speaking, the manufacturing standard for sanitary valves is very high. They are mainly developed for bio-fermentation companies and have very high requirement for the smoothness of the valve runner. 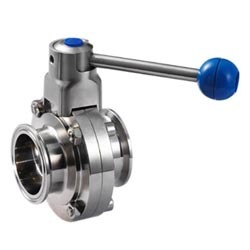 The part where sanitary valves have contact with medium is mostly stainless steel. The material used is usually 304SS or 316 stainless steel. Such material is non-toxic and non-hazardous, with a clean and smooth surface that doesn't produce corrosion and shedding. With special treatment after manufacturing and processing, sanitary valves can't be compared to industrial valves in many ways, such as cleanliness and simple installation, etc. They're widely used in food, medical and other industries. The models of industrial valves are decided according to the working conditions. 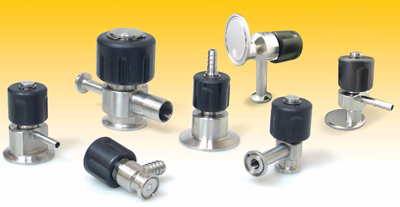 Industrial valves are mostly used in high-temperature and high-pressure working environment. They're widely applied in industries of machinery, metallurgy, petrochemicals, chemicals and urban construction, with characteristics like long duration and flexible operation. Although the exterior and interior of industrial valves are not as smooth and beautiful as those of sanitary valves, sanitary valves can't replace them in many occasions. All sanitary valve need to be disinfected, meeting certain health criteria. Non-sanitary valve manufacturers can not produce such valves because in non-sanitary valve materials, many of the toxic components are not elinimated (such as lead), which can cause poisoning, cancer, or even death.